At some point during my visit to Sephora, I break out in hives. But that’s okay, because there are hundreds of products to cure, or cover, the offending rash. Quilted Bear–This Utah-only shop is the largest craft store in the galaxy. Vendors try to out-decorate their booths, competing against women who grew up embroidering tablecloths, making furniture from grapevines and landscaping their Barbie’s townhouse. When I have the urge to walk through The Quilted Bear, I’ve devised a plan. I hit the deli for a soup bowl, the fudge display (for free fudge) and then I get the hell out before the Ghost of Better Homes & Gardens Past comes to hem my skirt and braid my hair. 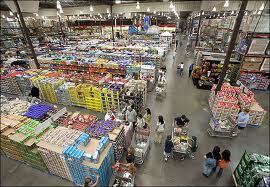 Costco–With the big families in Utah (and I mean “big” in every sense), a bulk shopping center makes sense. However, for those of us who feed two (occasionally three) people and a dog, a tub o’ mayonnaise seems unnecessary. Unless I get a job as a fry cook for the U.S. Marine Corps, I don’t imagine I’ll ever buy 50 lbs. of baking soda, a 40 lb. wheel of cheese or a quadruple case of laxatives. Although looking at all that stuff makes me crap my pants. 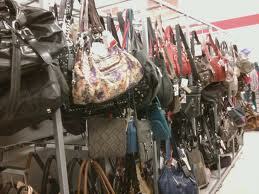 TJ Maxx –This is one store I visit on a monthly basis, but I need to brace myself each time. There are GREAT deals at TJ Maxx. The problem is looking through the thousands of NOT GREAT deals to find the good stuff. Some days, I walk in–and walk right out–not ready to delve into tons of clothing and shoes. 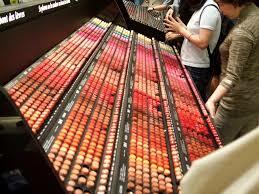 Other days, I plan ahead, stock up with trail mix, plug in my iPod and search the racks thoroughly. Barnes & Noble—Once I enter B&N, I get heart palpitations. Because I’ve made it a life goal to read every book ever written, seeing the shelves and shelves of books is a little discouraging. But, just like eating an entire cherry pie, I take it one bite at a time. OH Boy did I enjoy this post!!! We must have been separated at birth because this is just the way I feel. And if truth be told totally from my side I would say that I’m tired of being responsible. . .at age 62, after being responsible with my sister for looking after other siblings a lot of the time, raising 3 children, working full time much of the time since I was 14 and now 2 days a week, I’m tired. . .I just want to sit back and let others do it. Sounds really good to me. I just want to be involved in the few little things I’m involved in socially and in my church. . .that’s it! Thanks for this post, very funny and so very true!! !